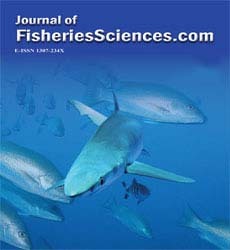 In this study, the effects of different levels of egg lecithin in diet of juveniles (Mesopotamichthys sharpeyi) were studied. Fish with initial average weight of 3.1 ± 0.17 g were fed with different levels of egg lecithin containing 0, 2, 4 and 6% in diet for 8 weeks. Fish were fed to satiation triple daily. At the end of the period, the growth performance, feeding parameters and lipoprotein fraction were examined for assessment of fish. The results showed that FAW, WG, SGR and survival of fish were fed with 6 % egg lecithin were significantly higher than 2% egg lecithin and control group (P< 0/05). Morphometric parameters of fish fed 6% egg lecithin were significantly higher than control and other treatments (p< 0.05). Also, higher feed intake, protein intake, FE and PER were observed in 4 and 6% treatments of egg lecithin (p< 0.05). Fish fed 4 and 6 % egg lecithin had significantly lower FCR than control and other groups (p< 0.05). Also, lipoprotein fractions containing HDL and LDL had increasing trend with increasing levels of egg lecithin in diets (p<0.05). Therefore, it is recommended using 4-6% egg lecithin in diet of Mesopotamichthys sharpeyi for better growth performance. Lipoprotein, Egg lecithin, Growth, Mesopotamichthys sharpeyi. One of the important economic factors in success of aquaculture production is feed. So, it should be produce base on nutrient requirements of fish, life stage of fish and physics parameters such as texture, color, size et cetera. It was mention, phospholipid in diets (PLs) lead to increased growth, stress resistance and survival of larval and juvenile stages of marine and fresh water fish species (Tocher et al., 2008). Studies showed the effect of phospholipids with better growth in flat fish (Kanazawa, 1993), ayu Plecoglossus altivelis (Temmink & Schlegel) (Kanazaw et al., 1981), Japanese parrot fish Oplegnathus fasciatus (Temminck & Schlegel) (Kanazawa, 1993), prawn Marsupenaeus japonicas formerly Penaeus japonicas (Bate) (Kanazawa et al., 1985), rainbow trout Oncorhynchus mykiss fry (Poston, 1990; Dabrowski et al., 2007; Azarm et al., 2013), Atlantic salmon Salmo salar L. fry (Poston, 1991) and Caspian brown trout Salmo trutta Caspius (Kessler) fry (Kenari et al., 2011). Different studies have reported different mechanisms of dietary PLs on growth performance of fish (reviewed by Coutteau et al., 1997). Phospholipids are the important part of cell membrane, it use in the biosynthesis of PtCho (Craig and Gatlin III 1997). PLs provide choline, phosphor and essential fatty acid for fish growth (Cottuea et al., 1997). Also, PLs induce increasing transport of saturated and mono unsaturated fatty acid as an energy flow from the intestinal enterocytes toward the blood (Morais et al., 2007). PLs induce to lower accumulation of lipid droplets in the intestine (Wold et al., 2007). Also recent evidence shows the beneficial effect of PLs on brush border (Gisbert et al., 2005; Hamza et al., 2008, Azarm et al., 2013) and pancreatic enzymes in fish larvae (Gisbert et al., 2005; Kenari et al. 2011; Azarm et al., 2013). By attention to studies, it seems using fish oil without PLs for formulation of diet, induce to decrease growth in juvenile of fish. Although members of the cyprindae are widely distributed in Iran and much attention has been given to their controlled mass production, however only a few studies on the formulation of suitable artificial diets have been reported (Albertini-berhaut, 1974; Papoutsoglouand Alexis, 1986). In spite of these studies, the picture is still not clear and the dietary requirements of Barbus sharpeyi (Günther.1874) inadequate, so more studies are required. Therefore, this study was conducted to investigate the effects of different levels of egg lecithin on growth performance, feeding parameters and lipoprotein fractions of (Mesopotamichthys sharpeyi) juvenile. Ingredients and proximate composition of the experimental diets are given in Table 1. Four experimental diets containing chicken egg lecithin were prepared. All diets were formulated to isonitrogenic and isolipidic. To determine the effect of different levels of lecithin on the growth performance; four levels of lecithin (0%, 2%, 4% and 6%) were used in reduction soybean oil. Dry ingredients were weighed and ground (100 μm particle sizes) and then mixed thoroughly. Fish oil, soybean oil, chicken egg lecithin and water were added to the dry ingredients and mixed again, until a dough was formed, which was dried at room temperature for 24 h and ground into desirable particle sizes. The diets were broken up and sieved into a proper pellet size, packed, and stored at -20 ˚C until used. Juveniles of (Mesopotamichthys sharpeyi) were obtained from a local farm (Maleki Farm, Khozestan, Iran). The fish were acclimated to laboratory condition for 2 weeks before starting the feeding trial. Juvenile fish (initial mean weight, 3.1±0.17 g) were allocated randomly into 300 L circular plastic tanks with 40 fish per each tank for the feeding trial after being collectively weighed. Three replicate groups of fish were hand-fed to apparent satiation three times a day (9:00, 13:00 and 17:00) for 8 weeks. During the experimental period, mean water temperature was 26 ± 1°C, dissolved oxygen was 6.33 ± 0.073 mg L-1 and the pH was about 7. The photoperiod was left under natural conditions during the feeding trail. At the end of experiment, juvenile fish in each tank were collectively weighed after anesthetizing with Carnation powder at a concentration of 30 mg L-1 after starvation for 24 h. Also at the end of the feeding experiment, blood was drawn from caudal vessel with 1 ml heparinized syringes from fifteen fish in each tank and transferred to micro centrifuge tubes for assessment of lipoprotein fractions. Proximate analyses of the diets were determined according to the method of AOAC (1995). Crude protein content was determined using the Kjeldahl method using an Auto Kjeldahl System (Kjeltec TM2300, Foss, Sweden). Crude lipid was analyzed by Soxtec system, moisture content by a dry oven (D-63450, Heraeus, Hanau, Germany) drying at 105℃ for 6 h and ash by a furnace muffler (550℃ for 4 h). High-density lipoprotein (HDL) and Low-density lipoprotein (LDL) were determined by the enzymatic photometric method using the kit manufactured by (Pars Azmoon, Tehran, Iran). Assay procedure of HDL is based on provided antibodies that block all lipoprotein fractions and then HDL oxidized to H2O2 by cholesterol esterase and cholesterol oxidase. After that, the concentration of H2O2 is measured spectrophotometrically at the wavelength of 600 nm. For assay of LDL, the other lipoprotein fraction is omitted by cholesterol esterase and cholesterol oxidase then concentration of protected LDL is measured spectrophotometrically at the wavelength of 600 nm. Therefore, briefly for assay of HDL and LDL using the same procedure, 250μl reagent A was added to10μl sample in 96 well-plate. After 5 min incubation at 37 ˚C leading to target lipoprotein retention and elimination another lipoprotein, 50μl reagent B was added and incubated again for 5 min at 37 ˚C, resulting in an enzymatic colorimetric reaction. At the end, plate was read by atoanalyzer (mindry BS-200). Data were subjected to one-way ANOVA to test the effect of sources and levels of lecithin on growth performance and lipoprotein fractions in fish. When significant differences were found in one-way ANOVA, Duncan,s multiple range test was used to rank the groups. All statistical analyses were performed using SPSS version 16 (SPSS, Chicago, IL USA) with a significant level of p<0.05. The values presented are mean ± standard deviation (SD). 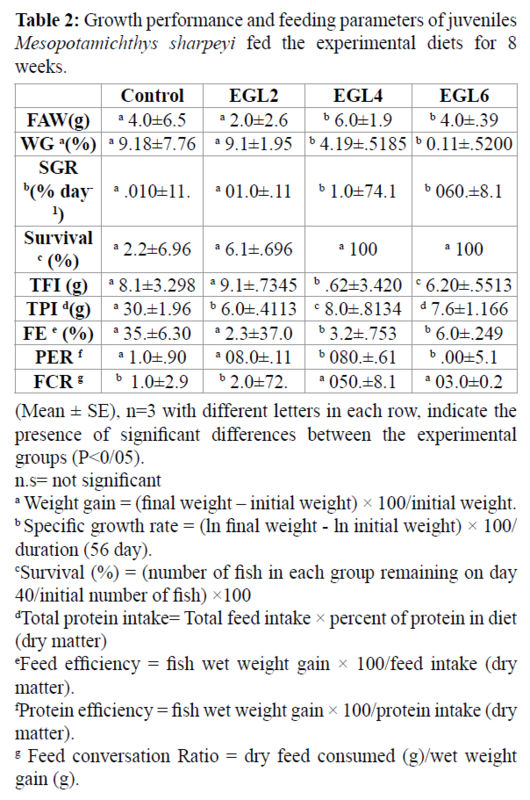 The growth performance and feeding parameters of fish fed by different experimental diets for 8 weeks are shown in table 2. Survival of juvenile was higher by using 4-6% chicken egg lecithin (p > 0.05). Final body weight, Weight gain (WG%) and Specific growth rate (SGR) were significantly affected by using 4% and 6% chicken egg lecithin compared to control group (p < 0.05). feeding parameters of juvenile fish fed 4% and 6% egg lecithin containing; total feed intake(TF), total protein intake (TPI), feeding efficiency (FE) and protein efficiency (PE) were significantly higher in 4% and 6% chicken egg lecithin group compared with control and other group (p<0.05). FCR was significantly affected by 4% and 6% chicken egg lecithin compared to control group (p < 0.05). The result of morphometric parameters and lipoproteinfraction are shown in tables 3 and 4. Condition factor (CF) and Hepatosomatic index (HIS) of fish fed 4% and 6% chicken egg lecithin were significantly higher than other and control group (p<0.05). On the other hand, Visceral somatic index (VSI) of fish were fed 6% chicken egg lecithin was significantly lower than control group (p<0.05). Also diets enriched in PLs result in change of LDL and HDL fraction. Therefore, juvenile were fed by chicken egg lecithin had significantly higher LDL and HDL than control group (p < 0.05). Table 2: Growth performance and feeding parameters of juveniles Mesopotamichthys sharpeyi fed the experimental diets for 8 weeks. Table 3. Morphometric parametrs of juveniles Mesopotamichthys sharpeyi fed with different experimental diets for 8 weeks. 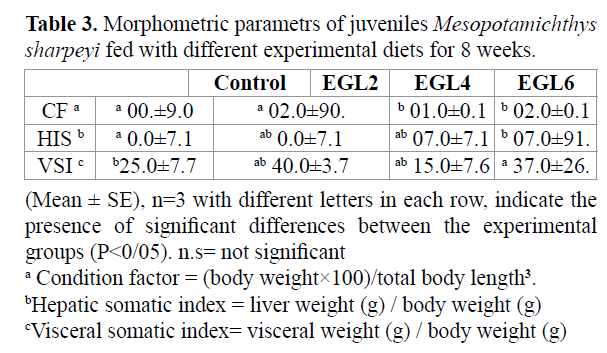 Table 4. lipoprotein fractions of juveniles Mesopotamichthys sharpeyi fed with different experimental diets for 8 weeks. It was mention that, PLs in diets lead to higher growth and survival of larval and juvenile stages of marine and fresh water fish species (Tocher et al. 2008). Therefore, the results of this study showed that PLs have beneficial effect on growth performance of Mesopotamichthys sharpeyi. Moreover, we observed 4% and 6% chicken egg lecithin led to a significant increase in juvenile’ final weight, specific growth rate and weight gain compared to control group. This finding is in agreement with other studies that reported using of 2% chicken egg lecithin in a diet of carp Cyprinus carpio L. larvae, turbot, Scophthalmus maximus L. juvenile, 3% in diet of ayu, 4% in diet of Caspian brown trout juvenile Salmo trutta fario (Kenari et al., 2011) and rainbow trout larvae (Azarm et al., 2013) improved growth performance compared to control group. This reason may be related to fatty acid composition of lecithin from different sources. Therefore, the effect of n-3 and n-6 PUFA on growth depends on in which form they are provided; if they are in PL fraction good growth are observed but it is significantly lower when they are in the NL fraction (Azarm et al., 2013). The more efficient use of HUFA supplied in the PL class of diet may be related to the ability of young larvae to better modulate phospholipase A2 expression than lipase (Cahu et al. 2003). Indeed, according to (Sargent et al., 1999a), some developmental promoting effects of PL are modulated by their fatty acid composition. Fry, survival was affected by 6 % chicken egg lecithin in diet. Also it was mentioned earlier that chicken egg lecithin induced to higher survival in ayu and carp larvae (Kanazawa et al. 1981 ; Geurden et al., 1995). It may be related to HUFA from chicken egg lecithin. It was reported that DHA-PC was more effective than triglyceride containing DHA to enhance tolerance of flat fish to environmental stress (Tago, et al. 1999). In addition it has been reported, arachidonic acid (ARA, 20:4n- 6) and eicosapentaenoic acid (EPA, 20:5n-3) of PLs as a source of eicosanoids can lead to improvement fish resistance by many physiological processes (Tocher et al. 2008). Chicken egg lecithin had a positive effect on feeding parameters. So, using 4 up to 6% egg lecithin induced higher feed intake, protein intake, feed efficiency and protein efficiency. On the other hand, egg lecithin induced lower feed conversion ratio compared to control group. This result in agreements with Sotoudeh et al., 2011 on Salmo tutta Caspius and Uyan et al., 2007 on olive flounder Paralichthys olivaceus. The reason can be related to higher digestive enzymes activity that secret by egg lecithin (Sotoudeh et al, 2011 ; Azarm et al, 2013) and also action of egg lecithin as an attractant via choline (Basker ville and Kling, 2000). Also, egg lecithin induced higher HIS and Lower VSI in fish. It was mention that PLs attributed in lipoprotein constitute and as a result higher transport of lipid from enterocyte to body tissue (Sotoudeh et al, 2011; Azarm et al, 2013). Pls leads secretion of bile acids, modulate fat of liver and glucose of blood. So, it induces low fat and high glycogen in liver (Lee et al., 2011). Also, it was reported that Choline causes prevention of fatty liver in red drum Sciaenops ocellatus (Craig and Gatlin, 1997). This study sets up feeding juvenile with diets enriched in chicken egg lecithin resulted in influence on lipoprotein fractions. So, chicken egg lecithin induced to higher LDL and HDL than those in control group. It was reported dietary PLs contribute to chylomicron production, thereby increasing the efficiency of lipid transport from the digestive tract to the body, s tissues (Salhi et al, 1999). Pervious study reported that De vono synthesis of PLs occurs in fish but it seems that this synthesis is not enough for formation of chylomicron during the rapid growth of early development (Cotteua et al. 1997). Therefore, lack of dietary PLs induced to accumulation of lipid droplets in the intestinal mucosa. As a result, the reduction of growth performance in fish (Gisbert et al. 2005). Also it has been reported that fish larvae have a limited ability to biosynthesize phospholipids de novo (Gerden et al. 1995) and may be exogenous PLs are required to satisfy the demand for lipoprotein synthesis (Fontagne et al., 2000; Azarm et al., 2013). The present study showed that the growth performance of juvenile Mesopotamichthys sharpeyi can be influenced by different lecithin sources so 4 up to 6% chicken egg lecithin induced the highest growth performance than other groups. By attention to the effects of chicken egg lecithin on growth performance, feeding parameters and lipoprotein fractions, it has been suggested that the beneficial effect of dietary PLs on growth performance of fish through decreased accumulation lipid droplets in intestine by increased level of lipoprotein fractions and as a result improved growth performance of fish. So, with regard to growth performance and survival the optimal supplementation of lecithin for juvenile of Mesopotamichthys sharpeyi is 4 up to 6% chicken egg lecithin (dry matter). The authors wish to thank to the Khorramshar university of Marine Science and Technology for their financial support. Albertini-Berhaut, J. (1974). Biological des stages juveniles de Teleosteens mugilidae mugilauratus risso 1810, Mugill capito cuvier 1829 et mugill saliens Risso1810. II. Modifications du regime alimentaire en relation avec la taill. Aquaculture, 4:13-27. Azarm, H. M., Kenari, A. A., Hedayati, M., (2013). Effect of dietary phospholipid sources and levels on growth performance, enzymes activity, cholecystokinin and lipoprotein fractions of rainbow trout (Oncorhynchus mykiss) fry. Aquaculture Research, 44(4): 634-644. Baskerville-Bridges, B., and Kling, L.J., (2000). Development and evaluation of microparticulate diets for weaning of Atlantic cod (Gadus morhua) larvae. Aquaculture Nutrition, 6, 171–182. Cahu, C.L., Zambonino Infante J.L.,BarbosaV., (2003). Effect of dietary phospholipid level and phospholipid: neutral lipid value on the development of sea bass (Dicentrarchus labrax) larvae fed a compound diet. British Journal of Nutrition, 90: 21-28. Coutteau, P., Geurden, I., Camara M.R., Bergot P., Sorgeloos P., (19970. Review on the dietary effects of phospholipids in fish and crustacean larviculture. Aquaculture, 155,149-164. Coutteau, P., Geurden, I., Camara M.R., Bergot P., Sorgeloos P., (1997). Review on the dietary effects of phospholipids in fish and crustacean larviculture. Aquaculture, 155:149-164. Craig, S.R and Gatlin, D.M., (1997). Growth and body composition of juvenile red drum (Sciaenops ocellatus) fed diets containing lecithin and supplemental choline, Aquaculture, 151, 259–267. Dabrowski, K., Rinchard, J., Czesny S., (2007). Influence of lipid class and fatty acid deficiency on survival, growth, and fatty acid composition in rainbow trout juveniles. Aquaculture, 264, 363–371. Fontagne, S., Burtaire, L., Corraze, G., Bergot, P., (2000). Effects of dietary medium-chain triacylglycerols (tricaprylin and tricaproin) and phospholipid supply on survival, growth and lipid metabolism in common carp (Cyprinus carpio L.) larvae, Aquaculture, 190: 289–303. Geurden, I.,Radunz-Neto, J., Bergot, P., (1995). Essentiality of dietary phospholipids for carp (Cyprinus carpio) larvae. Aquaculture, 131:303-314. Gisbert, E., Villeneuve, L., Zambonino Infante, J.L., Quazuguel, P., Cahu, C.L., (2005). Dietary phospholipids are more efficient than neutral lipids for long chain polyunsaturated fatty acid supply in European sea bass (Dicentrarchus labrax) development, Lipids, 40: 1-10. Hamza N., Mhetli M., Ben Khemis I., Cahu C., Kestemont P., (2008). Effect of dietary phospholipd levels on performance, enzyme activities and fatty acid composition of pikeperch (Sander lucioperca) larvae. Aquaculture, 275, 274-282. Kanazawa A., Teshima S., Inamori S., Iwhashita T., Nagao A., (1981). Effect of phospholipids on survival rate and incidence of malformation in the larval ayu.Memory of Faculty of Fisheries, Kagoshima University, 30:301-309. Kanazawa, A., (1993). Essential phospholipids of fish and crustaceans. In: Kaushik, S.J., Luquet, P. (Eds. ), Fish Nutrition in Practice. IV International Symposium on Fish Nutrition and Feeding, INRA, France. National Institute for Agricultural Research, pp. 519–530. Kanazawa, A., Teshima, S., Sakamoto, M., (1985). Effects of dietary bonito-egg phospholipids and some phospholipids on growth and survival of the larval ayu, Plecoglossus altivelis, Z. Angew. Ichthyologie, 4: 165–170. Kenari, A.A., Sotoudeh, E., Rezaei, M.H., (2011). Dietary soybean phosphatidylcholine affects growth performance and lipolytic enzyme activity in Caspian brown trout (Salmo trutta Caspius) alevin. Aquaculture Research, 42: 655-663. Lee, J. M., Lee, Y. K., Mamrosh, JL., Busby, S.A., Griffin, P.R. (2011). "A nuclear-receptor-dependent phosphatidylcholine pathway with antidiabetic effects." Nature, 474(7352): 506- 510. Morais, S., Conceicao, C L.E.C., Rønnestad I. b, Kovenc ,W., Cahud, C., Zambonino Infanted, J.L ., Dinisa, M.T., (2007). Dietary neutral lipid level and source in marine fish larvae: effects on digestive physiology and food intake. Aquaculture. 268,106-122. Papoutsologlou, E., Alexis, M., (1986). Protein requirements of grey mullet, Mugil Capito.Aquaculture, 52:105-115. Poston , A.H., (1990). Performance of Rainbow Trout Fry Fed Supplemental Soy Lecithin and Choline. The Progressive Fish-Culturist.1990. 52: 218-225. Poston, H.A., (1991). Response of rainbow trout to soy lecithin, choline and autoclaved isolated soy protein. The Progressive Fish-Culturist. 53: 85-90. Sargent, J.R., Bell J.G., McEvoy, L., Tocher, D.R., Estevez A., (1999a). Recent developments in the essential fatty acid nutrition of fish. Aquaculture, 177: 191–200. Sotoudeh, E., Kenari, A.A., Rezaei, M.H., (2011). Growth response, body composition and fatty acid profile of Caspian brown trout (Salmo trutta Caspius) juvenile fed diets containing different levels of soybean phosphatidylcholine. Aquaculture International 19, 611-623. Tago, A., Yamamoto, Y., Teshima, S., Kanazawa, A., (1999). Effects of 1,2-di-20:5 phosphatidylcholine (PC) and 1,2-di- 22:6-PC on growth and stress tolerance of Japanese flounder (Paralichthys olivaceus) larvae. Aquaculture, 179:1-4. Tocher D. R., Bendiksen, E.A., Campbell, P.J., Bell, J.G., (2008). The role of phospholipids in nutrition and metabolism of teleost fish. Aquaculture 280, 21-34.